The first pictures taken by the Dark Energy Survey (DES) after the study initiated in August 2013 have exposed a rare, 'superluminous' supernova that exploded in a galaxy 7.8 billion light years away. The stellar eruption, so-called DES13S2cmm, simply outshines maximum galaxies in the Cosmos and might still be seen in the data six months later, at the end of the first of what will be five years of spotting by DES. The occurrence was discovered by Andreas Papadopoulos, a postgrad student from the University of Portsmouth, who presented the finding at the National Astronomy Meeting 2014 in Portsmouth on Wednesday, 25 June. Superluminous supernovae are a new discovery, only being accepted as a separate class of objects in the past 5 years. These cosmic eruptions are 10-50 times perkier at their peak than the brightest standard kind of supernovae and, unlike other supernovae; their explosive reasons remain anonymous. Papadopoulos said "Fewer than forty such supernovae have ever been found and I never expected to find one in the first DES images! As they are rare, each new discovery brings the potential for greater understanding -- or more surprises." It turns out that even in this rare group, DES13S2cmm is strange and unfamiliar. The rate that it is diminishing away over time is considerably slower than for maximum other superluminous supernovae that have been detected so far. This alteration in brightness over time, or 'light curve', provides data on the procedures that triggered the explosion and the configuration of the material emitted. Before (left) and after (center) images of the region where DES13S2cmm was detected. On the right is a subtraction of these two images, displaying a bright new object at the center — a supernova. Credit: Dark Energy Survey. Dr Mark Sullivan of Southampton University ran the program to achieve spectroscopy of DES13S2cmm by means of the Very Large Telescope at Cerro Paranal, Chile. Sullivan said "It’s unusual, slow decline was not apparent at first, but as more data came in and the supernova stopped getting fainter, we would look at the light curve and ask ourselves, 'what is this?” Understanding the backgrounds of DES13S2cmm is very difficult. Radioactive decay is acknowledged to power usual supernovae, but not from such great quantities of material. Dr Chris D'Andrea of the University of Portsmouth, co-author on this research, explains "We have tried to explain the supernova as a result of the decay of the radioactive isotope Nickel-56, but to match the peak brightness, the explosion would need to produce more than three times the mass of our Sun of the element. And even then the behavior of the light curve doesn't match up." 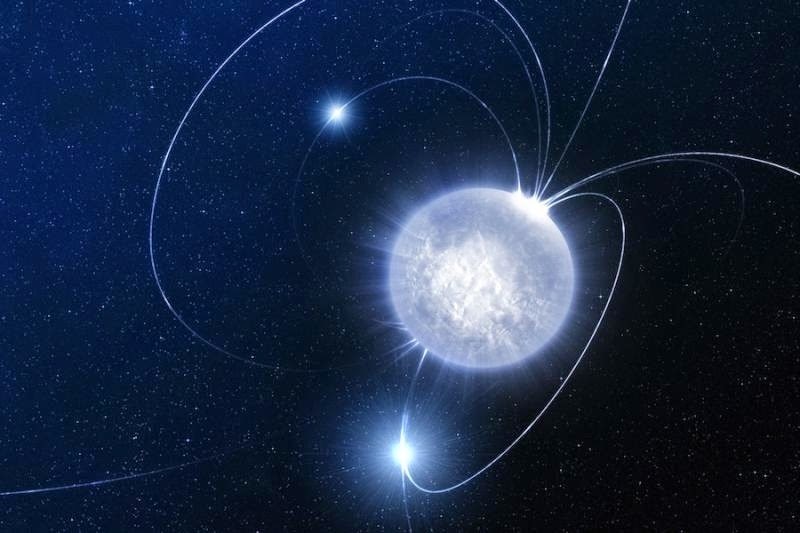 The group is now studying unconventional descriptions, counting that DES13S2cmm is a standard supernova that has formed at its core a magnetar, a mysterious neutron star rotating hundreds of times per second, generating a magnetic field a trillion times sturdier than that on Earth. Energy from the magnetar is then inserted into the supernova, creating the eruption extremely bright. D'Andrea noted "Neither model is a particularly compelling match to the data,"
With DES opening its second term in August, the search is on for further superluminous supernovae.